English Sample Paper ” Function English ” Set-1 for class 12, CBSE. 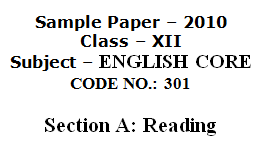 Sample Paper English Core (Code-301) for class 12, CBSE. Chemistry (044) Class 12, CBSE Question Papers 2013-2016, Complete Question Papers of Chemistry (044) Class 12 CBSE Mathematics (041) CBSE Question Papers 2015-2016, Complete Question Papers of Mathematics (041) CBSE. 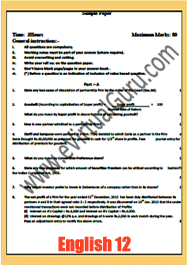 Political Science (028) CBSE Question Papers 2015-2016, Complete Question Papers of Political Science (028) CBSE.